I enter alot of contests and drawings. I'm usually laughing as I enter because I'm generally not lucky enough to win. Imagine my surprise when I found out that I had won a prize in the Knit Girls fundraiser this summer. I got my prize in the mail today. Know what it is? 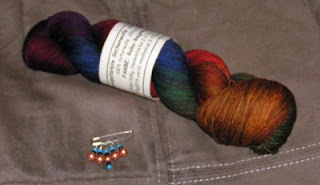 A skein of Wollmeise! Yep. It's pretty, too - I've seen some skeins online that are alot of icky color combos, but this one is nice, even with the gold color. Next to the skein is the second part of my prize - a set of stitchmarkers from Celticfrog.They will be lovely for a clapotis or small-gauge sweater. I'm very tickled about winning. Yay! I finished my Fawkes socks. I love the feel of the tencel blend yarn. It's so soft and smooth. If I had the gumption I'd make a cardi or pullover out of it - it would be so yummy to wear as a top. Heh, it would feel nice as yoga pants, too. Anyway, that makes four pair of socks this summer. Not bad. Of course, I haven't done much else, knit-wise. I'm trying for one more pair - the Dracula socks. The Summer of Socks KAL ends September first (I think), so I have a bit of time to finish them. I'm itching to read the Harry Potter books again. Why? Well, the new movie comes out this fall and I've entered a KAL/CAL that starts as the sock one ends. It's based on Hogwarts classes and should be alot of fun. I hope they put me in Ravenclaw, but I've told the organizers that they could place me wherever needed to balance things out. I'll be jumping from footwear to magic. Eric is home on vacation this week - it's strangely nice to have him here when I wake up. Pretty, pretty, pretty! Love the yarn, love the socks!